Thames Discovery Programme - Follow up your Finds! 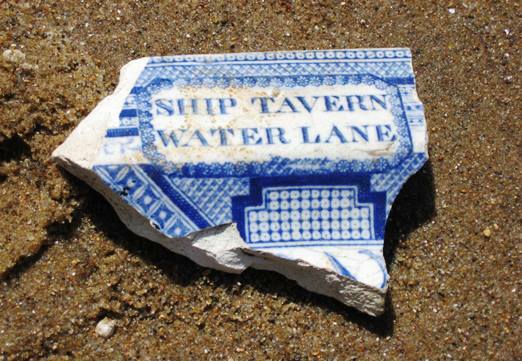 They may lead to a pub…..
During the Rotherhithe fieldwork, I found a sherd of pottery with the words “SHIP TAVERN WATER LANE” on it, so when I got home I googled this, hoping to find where it was. And there were plenty of references. 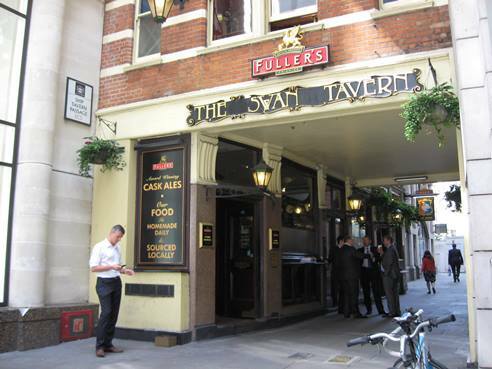 John Strype’s Survey of the Cities of London and Westminster in 1720 says that “a passage at the upper end of Custom House Court leads through the Ship Tavern into Water Lane”. This suggests one of those inns with a passage underneath for coaches. Custom House is over on the north bank of the river. The British Museum has a watercolour drawing of the Ship Tavern and Hotel, Water Lane, Thames Street, painted in 1857, a substantial building with an elaborate doorway. It’s described as having escaped the Great Fire. But it doesn’t have a passage through it, so maybe it had been rebuilt since the 1720 reference. 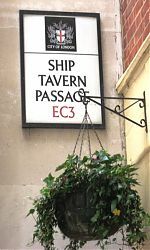 On the modern A-Z there is no Water Lane, but there is a Ship Tavern Passage, a turning off Gracechurch Street, so I thought I’d better go and have a look. 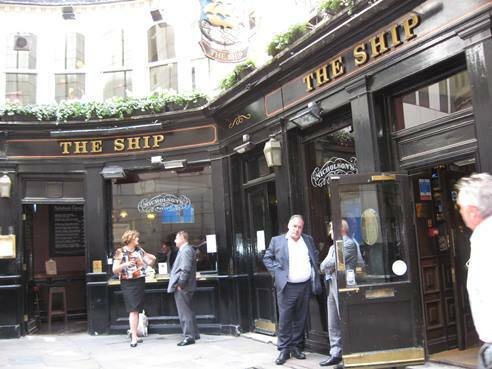 Interestingly, there is a pub there with a passage under it, but it’s the Swan, not the Ship. 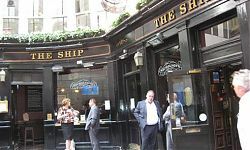 The girl in the pub didn’t think it had ever been the Ship, but told me there was a pub called the Ship, further down the hill in Talbot Court. 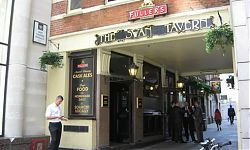 I checked that out too, but although it is the Ship now, it started out as the Talbot, and was founded after the Great Fire. 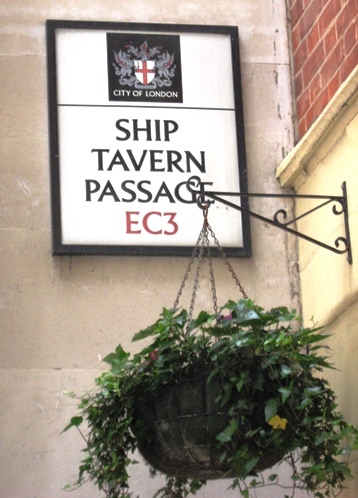 My guess is that the 19th century Ship Tavern was somewhere along the Passage called after it, but no longer exists. 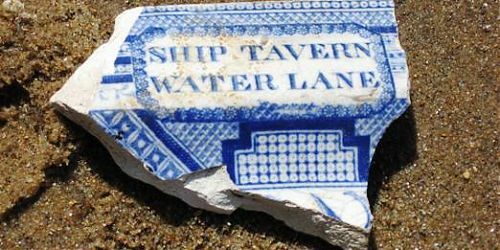 Also online is a very interesting article about Public Houses and their place on Blue Printed Transferware by Loren Zeller. The author points out that only fairly grand pubs or hotels could have afforded to advertise themselves by having their own china. Pictured is a willow pattern dish from the Ship Tavern, dated c1833, with a slightly different design to my bit of pottery. Their dish has the words Ship Tavern Water Lane at the bottom, and at the top it says WR and round that, “Dinners.Drest & Choice.Wines”. Of course I’ve only got a very small bit, but I think the words on mine must have been at the top, and I’m fairly sure mine was also willow pattern. As to how part of a Ship Tavern plate ended up on the wrong side of the river, I really don’t know. We can all make up our own stories for that!